Figure 21.2. 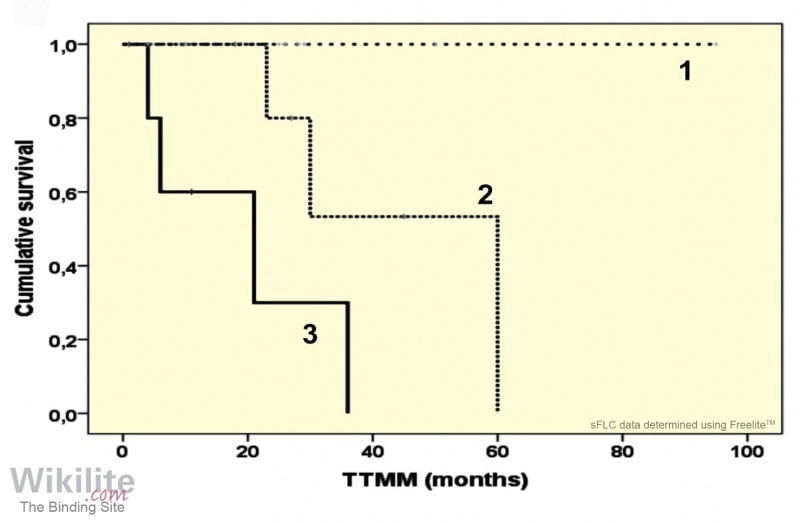 Kaplan-Meier plots for time to progression to multiple myeloma in 116 patients with solitary bone plasmacytoma and normal (62) or abnormal (54) κ/λ sFLC ratios. (This research was originally published in Blood  © the American Society of Hematology). Figure 21.3. Kaplan-Meier plots for survival in 116 patients with solitary bone plasmacytoma and normal (62) or abnormal (54) κ/λ sFLC ratios. Figure 21.4. Risk of progression in solitary plasmacytoma of bone using sFLCs and serum monoclonal immunoglobulins. Low, intermediate and high risk groups correspond to 0, 1 or 2 positive risk factors, respectively. (This research was originally published in Blood © the American Society of Hematology). Figure 21.5. 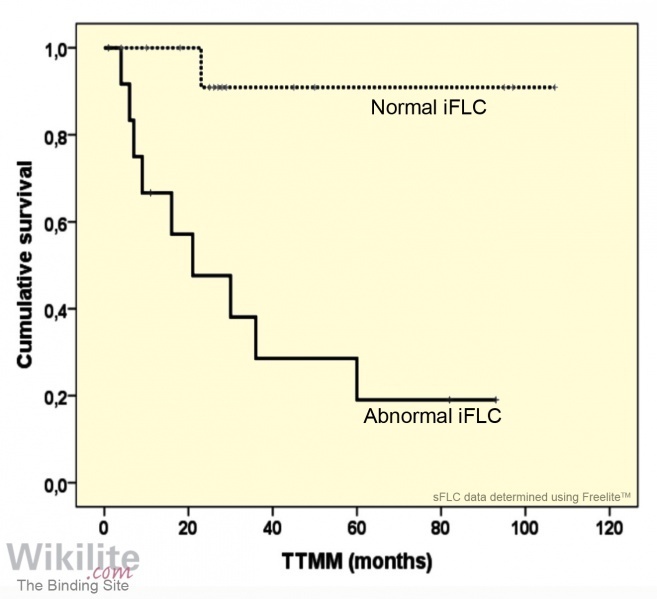 Time to progression towards MM (TTMM) in patients with solitary plasmacytoma and a normal or abnormal iFLC concentration at baseline. Figure 21.6. Solitary plasmacytoma risk stratification model. The three categories (1 - 3) are defined by the presence of 0, 1 or 2 risk factors (an abnormal iFLC concentration and ≥2 hypermetabolic lesions on initial PET CT). (Reprinted by permission from the American Association for Cancer Research ). A number of groups have identified prognostic factors that are associated with inferior disease-free survival and progression to MM. These include tumour location and size , presence of a monoclonal protein at diagnosis , and levels of uninvolved immunoglobulins . In addition, bone marrow plasmacytosis  and the persistence of a serum monoclonal protein after treatment  have both been consistently associated with inferior progression-free survival (PFS). However, as persistence of a monoclonal protein can only be assessed 1 or 2 years after initiation of therapy, there is a clear need for alternate reliable prognostic markers that can be measured at diagnosis . 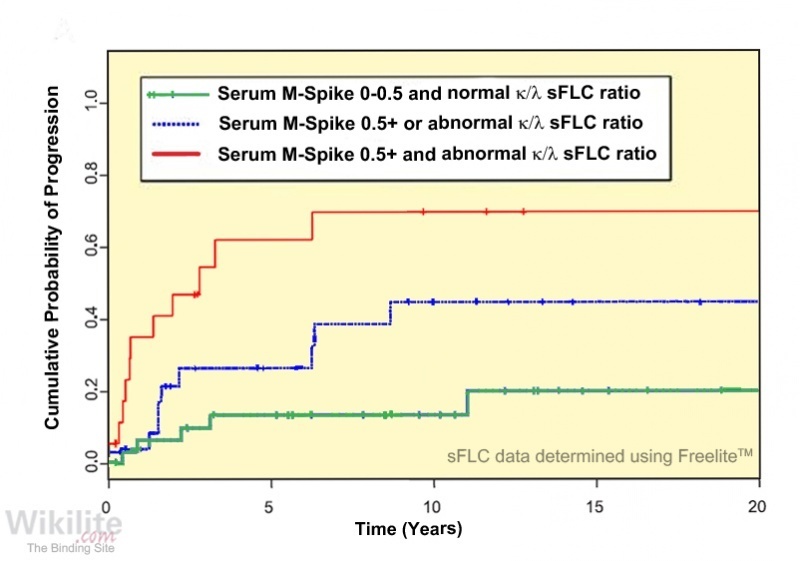 The prognostic utility of baseline sFLC measurements in SBP was first evaluated by Dingli et al. . During follow-up, a total of 43/116 patients progressed to MM with a median time to progression of 1.8 years. 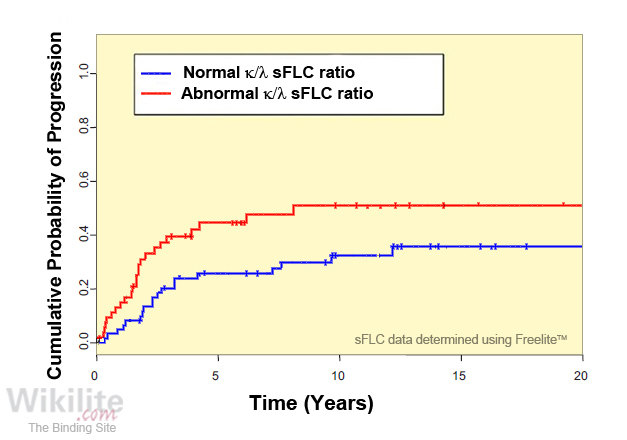 Patients with an abnormal κ/λ sFLC ratio had an increased risk of progression compared to those with a normal ratio (44% vs. 26% at 5 years, p=0.039) (Figure 21.2). 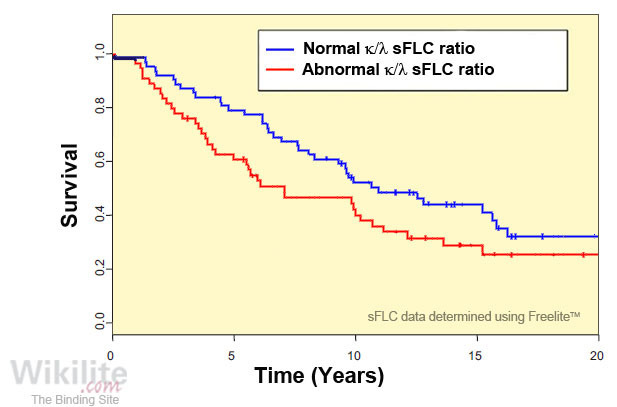 Patients with an abnormal κ/λ sFLC ratio at diagnosis also had a shorter overall survival (Figure 21.3). Persistence of a serum monoclonal immunoglobulin (≥5 g/L) after 1-2 years of therapy was an additional risk factor for progression to MM. A risk stratification model was constructed based on these two risk factors, which defined low-, intermediate- and high-risk groups with 0, 1 or 2 risk factors, and with 5-year progression rates of 13%, 26% and 62%, respectively (Figure 21.4). The authors commented that sFLC analysis provided important prognostic information in solitary plasmacytoma. A subsequent study by Koch et al. confirmed the prognostic value of baseline sFLC ratio measurements. Fouquet et al. assessed the prognostic utility of sFLCs and whole body fluorodeoxyglucose positron emission tomography – computed tomography (FDG-PET CT) in 43 patients with solitary plasmacytoma (33 SBP and 10 EMP). By univariate analysis, an abnormal iFLC concentration, an abnormal κ/λ sFLC ratio or the presence of ≥2 hypermetabolic lesions on initial PET CT were associated with significantly shorter time to MM progression (Figure 21.5, p=0.002; and data not shown). On multivariate analysis, an abnormal iFLC concentration and the presence of ≥2 hypermetabolic lesions on PET-CT were the strongest independent prognostic factors identifying patients at greatest risk of progression to MM. A risk stratification model based on the presence of 0, 1, or 2 risk factors demonstrated that the median time to progression to MM for each group was “Not reached”, 41 and 21 months, respectively (Figure 21.6). Leleu et al. monitored 10 SBP patients and observed a trend towards shorter time to progression to MM in patients with no change in sFLCs following radiotherapy. The same group  later described a patient with monoclonal κ sFLCs. At disease relapse, sFLCs were abnormal while electrophoresis and MRI were both unremarkable. A subsequent MRI scan and biopsy confirmed relapse 6 months later, whilst electrophoresis results remained normal. In summary, these reports indicate that baseline sFLC abnormalities consistently associate with increased risk of progression of solitary plasmacytoma to MM, and that sFLCs may be useful for monitoring response to treatment and disease relapse.